Tune in to SPTV.me this weekend for thousands in gear gifts & lighting tips! Beautiful lighting from one small bag. Why is speedlighting so popular? For the same reason that wearing cotton underwear is better than rusty iron skivvies – they are lighter, easier to move with, and don’t cause chaffing! You can do amazing things with speedlights, if you have the secret skills and a simple collection of the right accessories. Create the three most important lighting styles with minimal equipment, in studio or on location. Balance your flash with existing light for dramatic effects. Learn how to take high-speed sync to the next level. A simple system for metering and balancing light from multiple sources. Using just ONE speedlight to dramatically enhance any images. PhotoPlus Expo was all about making images move – whether through the abundance of devices to stabilize your video, like the Freefly gimble systems, animated pull-focus 3D images with the new Lytro Illum camera, or software to create Cinemagraphs. All of these new and exciting products are optimized for online presentation and sharing. This stirred several conversations about the future of prints, and how photographers can actually monetize moving images that may be destined for online viewing only. It's a relatively new paradigm for photographers – planning to sell and share images in a virtual space, with no intention, or practical way to created printed images. What do you think? I know, I know, let's talk about the cool new gadgets first! Compact motorized gimbal systems have become all the rage. Nikon introduced the D750 camera recently and had a very inspiring promotional video for it showing the artful use of such a device – spurring viewer interest and no doubt boosting the popularity of "smart" stabilizers. Motorized gimbals aren't new, but compact and affordable systems have really surfaced lately, giving the average pro videographer some seriously powerful tools for high-quality moving footage. Freefly had an impressive display of products, ranging from their giant copter to a hand-held gimbal, to a remote controlled off-road buggy with a gimbal camera mount riding it like a giant mechanical spider hitching a ride on one of Mad Max's vehicular creations. I just want this. I want it. I want it. Defy displayed their popular gimbal systems, as well as a few other lesser known and import companies. Motorized gimbalI systems are a type of camera stabilizer where the shaky motion of the camera is automatically stabilized on 3 axes by software controlled micro-motors. It is similar to the way internal lens stabilization works, but on a grander, external scale. I asked a friend who is a video professional and educator about the draw of the motorized gimbal and he said "They are awesome. If you do any kind of moving video, they are well worth the investment." Well, all-righty then. There were many other goodies to get excited about for video content creators. ProMediaGear had a plethora of beautifully machined camera brackets, ball heads, and mounting gizmos, but my favorite from them was the 2-in-1 video slider, called the PMG-DUO Slider, that had a straight track on one side and a curved slide on the other. You just flip it over. A curved slider would allow you to focus on a static subject and slide around it, effectively making the background seem to move while the object stays relatively centered. The double-sided Duo slider from ProMediaGear. The machining quality of their products was impressive. The rollers move very smooth. Even if you're not yet ready to commit to full video editing, you can bring your still images to life with Cinemagraphs from Flixel. Technically, the Cinemagraph is a short video clip where part of the image is "frozen" and the rest is allowed to play and move. Imagine a portrait of someone standing in front a waterfall, where they are still and the waterfall continually flows in the background. Flixel has software packages for computers and iPad that create your Cinemagraph with a few brush strokes and button clicks. The results can be quite engaging, although I wonder if it would be a lasting trend or something that would be overused and quickly grow old. It all depends on the quality of the original image, I suppose, as with most image enhancing tools. Lytro has also expanded their unique light field imaging system with a new camera called the Illum. The magic of light field imaging is that it captures light in an entirely different way than typical camera sensors do. You capture an image with what is effectively and "F2.0" lens, but it is actually seeing light in such a way that you can change your focus point after the image is processed. You can also change the "F-stop", effectively creating the depth-of-field look from F2.0 to F16 from the same image. Sounds crazy impossible, doesn't it? While software is used to extrapolate the image information, it is not used to "blur" parts of the image to simulate the various focus and f-stop effects, like one might do with Photoshop. The camera truly captures all the information it needs and the software lets you decide how to display it later. The original Lytro camera was a little rectangular box, sized to fit in your fist, that was fun to use, but felt a bit limited in functionality. The new Illum has more of a traditional mid-sized digital camera feel, while still being quite unique in design and functionality. It has an 8X optical zoom fixed lens, giving you the equivalent of 30-250mm. A large, upward angled touch-screen allows you to compose and manipulate your images. The new Lytro Illum camera has an angled screen for easier viewing and a fixed 30-250mm equivalent lens. If we look a little confused, we were. The Lytro is fascinating technology, but there is a slight learning curve. The results seem worth the effort though. It takes some getting used to as I played with the camera for a bit and had to be instructed on how to operate it – which is not typically the case with me and cameras. The reward, however, for a little patience and thoughtfulness can be remarkable, interactive images that involve the viewer in the image experience. The Lytro software can even create an animated sequence that shifts focus across various parts of the image. You can create 3D images, (viewable with appropriate glasses and screens) or somewhat correct for parallax issues within the same image due to the extra light field information the camera captures. It's remarkable technology that I'm eager to see evolve. Play with the image above by moving it around or clicking the foreground and background subjects and watch the focus change. My friends at Wescott always have cool gear to show, and besides the popular IceLight and Jerry Ghionis' new Omega Reflector (which I've reviewed previously here), they had their new Wescott Flex, foldable LED light panels! How cool is that! I want one! The Wescott Flex looked really cool and I can imagine several great uses for it, including wearing it as a neck tie so I always have flattering beauty light on me. What other little gadgets got my attention? While cruising the floor with my buddy, Craig Strong – father of the Lensbaby, he pointing out the Lens Flipper, by GoWing. This is one of those things that you smack your head and go, "Why didn't anyone think of this before!" Simply put, it's a double-sided lens mount, attached to a shoulder strap. How many times at your wedding have you wanted to switch from your humongous 70-200 mm lens to your wide angle, and fumbled with a place to put the monster while you swapped them out? The Lens Flipper keeps your two most used lenses at the ready. You detach the 70-200 from the camera, attach it to the Flipper, then remove the other lens from the opposite side mount and pop that on your camera. The large lens hangs securely attached to the Flipper and ready for your next swap. So simple and handy! Event photographers should be flipping for this thing. The Lens Flipper would be really useful for event photographers who swap lenses frequently. Speaking of Lensbaby, they always have something cool to show and amongst other things, they have their new mobile phone lenses available! See in a new way everyday with a variety of attachments for fun effects on your iPhone or Android. Lensbaby does it again. Lensbaby always has something to make photography more fun. I must admit. I love shoes and bags. Maybe I'm a little too in-touch with my feminine side, but that's the way it is. When I find a groovy new bag, I get excited. 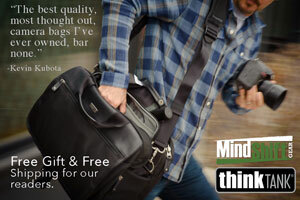 I've been admiring the ThinkTank bags for some time and they have some new additions to their MindShift line that I really like. There are now more sizes and options available to the unique backpack design that swings your camera compartment from back to your front in seconds flat – without having to remove the backpack. You get comfortable carry and fast access to your essential gear all in a very high-quality and thoughtfully designed bag. I look unhappy in the photo below because Clare wouldn't let me buy the bag yet. Xume was there showing how easy it is to change lens filters when they are magnetically attached instead of screwed on. I use a neutral density filter frequently so the Xume system could come in quite handy. They actually still have a show special going on right now – you can get 20% off when you purchase at XumeAdapters.com with coupon: "PhotoPlus 2014". Magnetic rings hold your filter securely and pop on and off in an instant. No more screw frustration. I think there's a term for that. Of course, Photo Booths were still popular and Smilebooth was one of our favorites, as you can probably tell. The Smilebooth has a magical effect on you. Did you go to PhotoPlus? What were your favorite things? How do you think pro photographers can monetize moving images shown online?